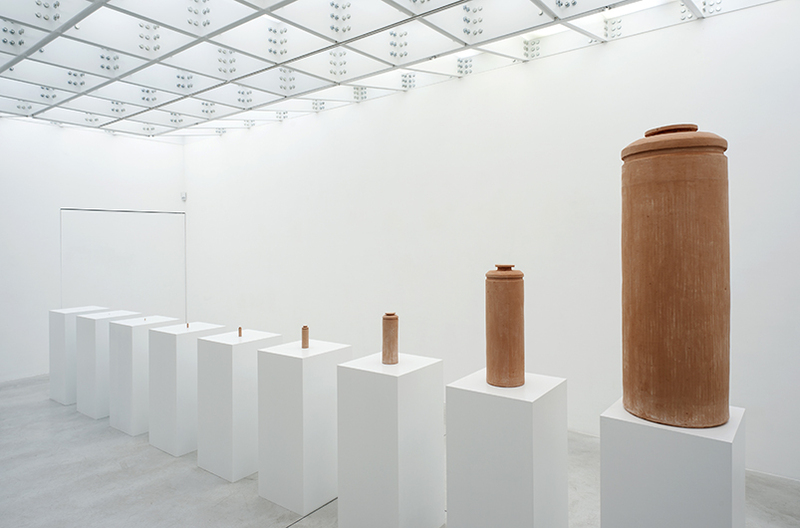 Series of 9 ceramic nuclear storage containers made with natural Boom clay. Produced in collaboration with Fabrique Ceramique. Half Life consists of a series of copies in baked Boom clay of the storage containers for nuclear waste in Belgium. The Boom clay comes from a strata of clay, between two hundred or even four hundred meters deep that is being tested as one of the possible geological locations for Belgium to store its nuclear waste in the future. The same clay that comes out of the ground to make the storage of the containers possible, is used to make an exact copy scale 1: 1. The next model in the series is exactly half the size, etc etc, referring to the decrease of nuclear radiation, which is visualized by the shrinking size of the containers. After nine steps, or nine lives, the original size of 1335mm has shrunk to 5.21mm, after which it becomes practically invisible to the human eye. 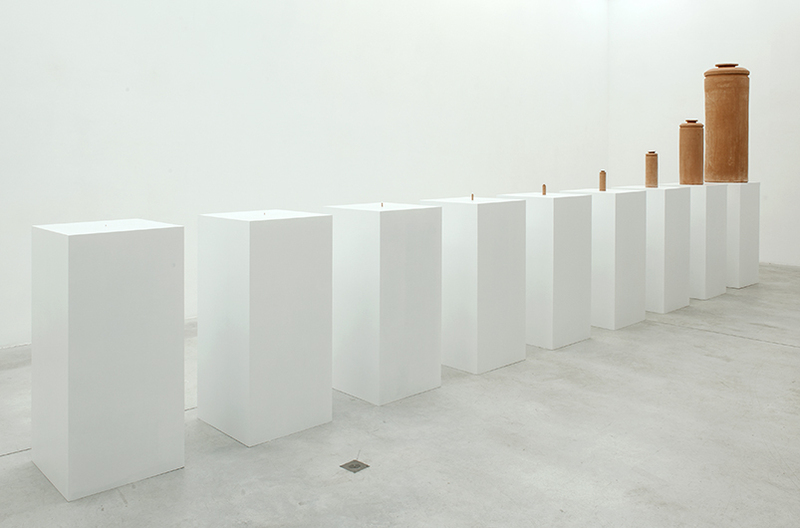 Each step is presented on a separate but identical pedestal, which strengthens the halving and shrinking curve. Half Life simultaneously visualises the process that takes place underground and the material that protects it and with which it is replaced. In an uncertain future, where every language that we know of now will probably have disappeared, a similar visualization could help to transmit vital information about the content below ground. 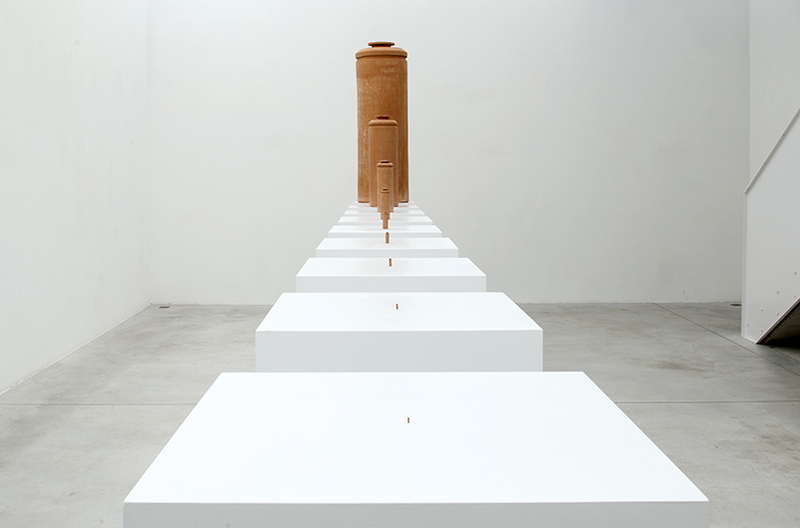 The work fuses both the natural material, the Boom clay, but also the natural Uranium, with the human intervention of processing Uranium and the creation of a standard shaped capsule to store nuclear waste. Form and content become one.